New 3D simulations on powerful supercomputers help predict the formation of growth disks and relative jets, which are sized by the strong gravitational forces of the black holes and the strong magnetic forces they generate. In the order of hundreds of thousands to billions of solar masses, a supermassive black hole (SMBH) is the biggest form of the black hole and it is found almost at the center of most known giant and massive galaxies currently. In the case of the Milky Way, supermassive black hole matches the location of Sagittarius A*. The size of a supermassive black hole is a direct correlation with the galaxy where it is present. About a decade ago, researchers had calculated that the mass of a supermassive black hole continuously relates to the mass of the middle part of its galaxy, which is known as its bulge. This 1 to 700 relation supports the notion that the development and structure of the galaxy are closely related to the scale of its black hole. Supermassive black holes have properties that separate them from low-mass classification. Firstly, in the case of some supermassive black holes, the average density of SMBH can be lower than the water density because the Schwarzschild radius is directly proportional to the mass, whereas the density is inversely proportional to the volume. As the volume of the spherical object is directly proportional to the cube of the radius, the density of the black hole is inversely proportional to the square of the mass, and thus the average density in high mass black holes is less. 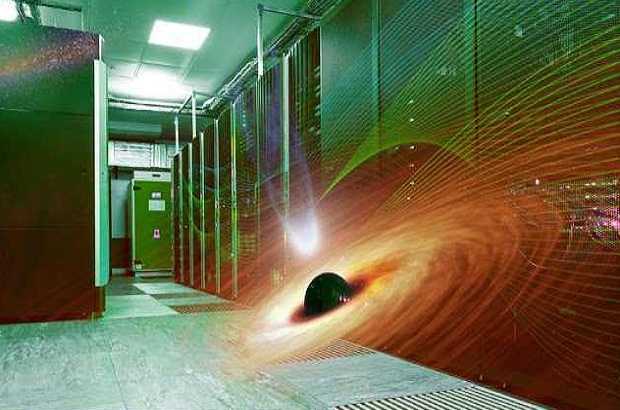 In addition, tidal forces around the event horizon are not strong for massive black holes. While any significant tidal forces will not be experienced by stellar mass black holes at very depth. A supercomputer is a type of computer with high-level performance compared to a normal purpose computer. A supercomputer has resources, architecture, and components to get huge computing power. Today's supercomputer includes thousands of processors capable of calculating billions and trillions. The measurement of the supercomputer work is performed in floating-point operations per second rather than millions of instructions per second. Although there are thousands of processors in the supercomputer and sufficient floor space is required, they contain most of the major components of a specific computer, including processors, connectors, peripheral devices, one operating system, and application. Indeed, supercomputers are designed primarily to be used in organizations and enterprises that require heavy computing power. A supercomputer incorporates operational and architectural principles from parallel and grid processing, where a process is executed simultaneously on thousands of processors or distributed among them. Supercomputer plays an important role in the field of computational science including cryptanalysis, quantum mechanics, climate research, weather forecasting, oil and gas exploration. It is also used for a wide range of computationally intensive tasks in different areas including molecular modeling and physical simulation such as imagine the early moments of the universe, aerodynamics, airplane, and spacecraft etc. Big Bang has captured our imagination like any other theory in science: the glorious, explosive birth of our universe. But did you know what happened next? Professor Michael Norman, a lead author of a new review published in Frontiers in Astronomy and Space Sciences, said in a statement” About 100 million years of darkness. When the universe eventually burned their first stars, they were larger and bright than any person. They became so intense with UV light; it turned the atoms of the surrounding to ions. Cosmic Don - From the first round of the completion of this 'Cosmic Reunion', lasted nearly a billion years. And how did these stars become galaxies, and Where did they come from? - the universe is getting along with radiation and plasma - which we see today? These are our driving questions". Some researchers like Professor Norman have solved mathematical equations in a cubic virtual universe and explained “We have spent more than 20 years in using this software for better understanding and cosmic donation. To get started, the code was made that allowed the formation of the first stars in the universe. These equations describe the movement and chemical reactions before the light, in a universe of gas inside the clouds, and a lot of mysterious dark matter Large gravitational pull of large but invisible mass. These clouds of pure hydrogen and helium are called gravity to burn single stars, big stars fell under the nourishment - hundreds of times heavy our sun. The first stars, the first heavy elements made in the pressure-cooker core: a smidgen of lithium and beryllium. But with the death of these short-lived veterans - falling and explosion in a shiny supernova - heavy metals in the form of iron were made in abundance and thrown into space. Equations were added to the Virtual Universe for the model enhancement of gas clouds with these newly formed metals - which inspired the formation of a new type of star. Formation of metal-free giant stars did not stop altogether - these stars should have small galaxies where there is enough dark matter to cool the ancient clouds of hydrogen and helium. The transition was rapid: within 30 million years, almost all the new stars were metal-rich. This is despite the fact that chemical enhancements were local and slow, leaving the virtual universe more than 80% of the metal-free till the end of the simulation. But without this huge gravitational pull, the stars and tears of the intense radiation gas from existing stars separate their molecules. So in most cases, the metal-free gas completely collapses to form a single, supermassive black hole. The new generation of stars formed in galaxies is small and very high due to the chemical reactions made with metals. The increase in the number of reactions in the gas clouds caused them to break and block many stars through the metal line. Cooling allowed to make; Tract of reduced gas density, where to combine elements to radiate their energy in space. Let's find rooms - instead of each other. At this level, we have the first things in the universe that can be correctly described as galaxies: the combination of dark matter, metal-rich gas, and stars. The first galaxies are smaller than expected because the youth, intense radiation from heavy stars runs dense gas away from star-producing areas. In turn, radiation from very small galaxies has cosmic re-energies. These difficult-to-recognize but many galaxies can, therefore, be responsible for the estimated end date of Cosmic Don - that is, when the cosmic reunion was completed. Professor Michael Norman and his colleagues explained how some groups are able to control the computing boundaries by importing their finished results in these numerical simulations or simplifying portions of relevant models for the results of interest. These semi-analytical methods have been used more precisely to determine how long the initial free stars of metal were being made, how long they can be seen, and their contribution - as well as Black Holes and metal-rich stars - for the cosmic reunion or reionization. The authors have also highlighted areas of uncertainty that will run a new generation of simulations in the future using the new code on high-performance computing platforms. "This will help us to understand the role of magnetic fields and X-rays and dust in the gas space cooling, the identity and the behavior of the mysterious dark matter that inspires the formation of stars."